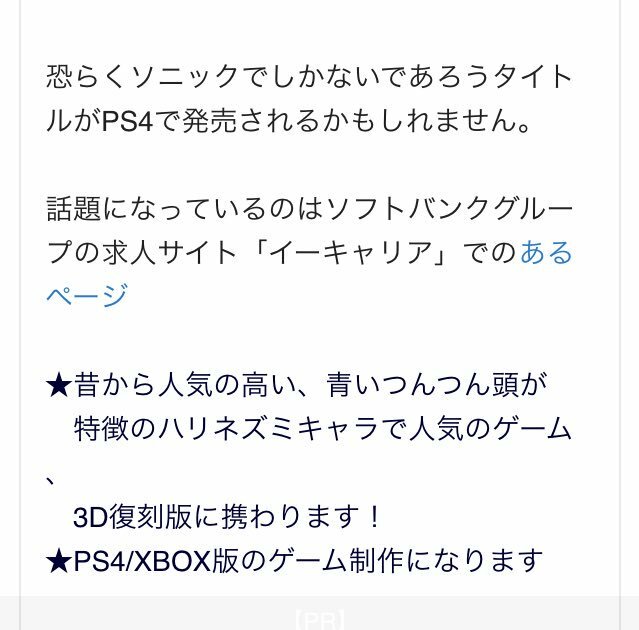 Japanese Job Advert Hints at New PS4/Xbox One Sonic Game? A number of detective Sonic fans have discovered an old job advert for an video game company, whose name isn’t disclosed. However the description of the advert has some very strong hints that the company is Sega and that the job advert is for work on a new Sonic game. Now the original source for this job listing has since been removed, however, a number of other sites have copied parts of the job listing and linked back to it. Based on the information which is currently flying around various outlets, this is what has so far been found written in it’s original form. you engaged in 3D reprint! Another machine translation of the original listing which is doing the rounds is as follows. A long time ago, Sonic fought tooth and nail on the game market, his main recognizable feature are his blue spikes. At the moment we are preparing re-release of games for next-gen consoles (PS4 and Xbox one). To summarise as best as I can. 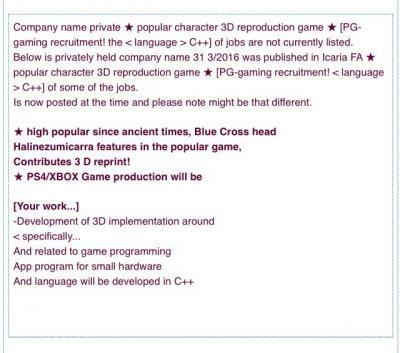 A job advert has been posted a few months ago for a ‘private’ videogame company. PS4 Xbox One as the platforms. Blue Hedgehog character is mentioned. The 3D reprint is likely open to a lot of interpretation, it could mean utterly anything, that the game is a 3D game, a 3D remake of a game, a 3D game based on an original 2D property (which would be accurate for every Sonic game since Sonic Adventure), one twitter user has gone as far to say it means “3D remake of a classic”. If anyone is able to provide a better translation, even if it’s to debunk this, can you please let us know in the comments. By better translation we do not mean a Google or any other machine translation. Don pay much atentin to the term “reprint”. It sounds like a translation error. Hmm… Are we getting remastered versions of the Mega Drive games? That’s something I could definitely get behind. Especially if they have a visual style like Sonic 4. Yes, this is where my thoughts were flying to as well. I would definitely like to see remakes or remasters of the originals..! Interesting bit of information, Hogfather! this hint is a error you know and because the new 2015 sonic game has been move to a 2016 game on every consoles and i dod have proper evidence to show you. Sonic Adventure 3 denied. SEGA is done with the adventure series. I don’t remember when but I do know that SEGA wanted to move away from the Adventure series. They wanted to do something different than the Adventure series. Seaside Hill denied, Sonic Adventure 3 expected! SEGA’s done with Adventure series. If they were wanting to do a Sonic Adventure 3, they would’ve done so a long time ago. It would’ve been a 6th gen game. Are they adamant against others wanting to do a Sonic Adventure 3. Just because they’re not interested in developing the game, doesn’t mean they should keep one from existing. Sonic Unleashed was the last Adventure Series title. Remember Unleashes Japanese title is Sonic’s World Adventure therefore it is an Adventure Series title and it is the 3rd title in the Adventure Series therefore it is Sonic Adventure 3. So people please stop asking for Sonic Adventure 3 when we already have it. High popular since ancient times? Like the Roman Gods of old! Sonic is the God of Wind whose followers worship with an almost Fanatic attitude. All haters must be purged from the Earth says the bible of SegaSammyClassicFan… “Those Fricken Fricks” as the prophet calls them! I really hope it does come to PC. Let’s hope they announce it much earlier than Generations. Also, I understand that ‘3D reprint’ could mean anything…but given certain hints throughout the year, a 3D remake of a classic wouldn’t be suprising. How do they always call Woun member of SSMB and not SonicCIS? I’ve been advocating the idea of 3D remakes of classic Sonic titles for a while now, so if this turns out to be the case I will be very excited. Of course, this could still mean many other things, if it even turns out to be legit at all. Guess we’ll find out soon enough whether our theories are in good standing or not, we’ve got at least one month left before we learn of any potential anniversary games this year. I’m so sick of this, like, “hints” to a new Sonic game. You’re seriously trying to use a Google Translate translation as a source or hint? The cringe is strong in this one. Anyway, Sonic Heroes, Shadow the Hedgehog, Sonic Riders, Sonic and the Secret Rings, Sonic ’06, Sonic and the Black Knight, Sonic Unleashed, Sonic Lost World and Sonic Boom: Rise of Lyric are all 3D games based on original 2D adventures? M’kay. …What exactly is the problem here? Yes machine translations were used…. in conjunction with human translations in order to try and understand what was written. Both sources came up with similar words and phrases. Seriously what are you complaining about? The fact Google translate’s an awful tool to even use in the first place for a task like this. What it came out with here is more than proof of this fact, it’s like using Wikipedia as a source. It’s the worst thing a news site like this could possibly do when providing information, true or otherwise. In fact, I’m pretty sure there’s better apps you could’ve used (although don’t quote me on that). You’re complaining about nothing… Aren’t you? this is fake you know if the new sonic game wont be on every consoles on Wii U Xbox One and PS4 then SEGA is not gonna win there fans back damn it i dont want the new game for the PS4 and XB1 i want it on every console. the title was suppose to be coming in to 2015 on PS4 Xbox ONE and Wii U but instead they move the game for 2016 title so that source that i show you they just move it. i just want those elements to be on every consoles. it does prove something a guy on twitter show me this and he prove that the title is a new 2016 console title so theres no way SEGA can not ditch the Wii U or PC and we all know that nintendo will be done with Wii U games in late 2017 because they are trying so hard to get the Wii U console to be on there markets for a while until 2018. and also SEGA do put sonic games on every consoles. PS4 and Xbox One are consoles. PC is not. They have put Sonic games on just one console (or family of consoles) in the past, multiple times. Some of their biggest games have been exclusive to Nintendo. I also don’t recall Sonic ’06 appearing on any Nintendo console so it’s not impossible for them to ditch Nintendo for one game. I failed to understand the rest of what you said, unfortunately. well theres no need to be sorry about that. nintendo do have a long relationship with SEGA since the gamecube era and the wii era so thats basically my point right here. i understand that PC is not consoles but only PS4 XB1 & Wii U are consoles so, if this new anniversary project gets on 3 eighth generation consoles then that would be a prefect sonic anniversary game right there. sonic 06 was a bit slow and crappy in 2006 after Yuji Naka left SEGA because he knows the game turn out to be a big failure. So… Sonic Generations with the original plots? That’s actually a pretty awesome idea (similar to Star Fox Zero’s reimagining). Sounds similar to something I came up with for Sonic Legacy: Episode I. Of course I also included Sonic’s humble beginnings on Christmas Island, Sonic 2 (8-bit), SegaSonic Arcade, and Sonic Chaos. I don’t care. I’m too tired to fret over things we won’t remember when the game finally does come out. I just want a game where the consequences of Sonic Boom’s “Two Good To Be True” are realized, and we get Eggman working with his other self to take over and reshape their dimensions in their own image. It’s so the Sonic Boom characters can FINALLY be on SFM and GMod, without me having to do all the dirty work, and made available to the public. This is great and all but I’m not interested until a new game is actually announced… until then I shall continue to day dream of an actual good, brand new, original, main-stream, adventure-style title. What about the Wii U? What about people who own the Wii U? What are we supposed to do? Nintendo themselves are dropping the Wii U like a drunk night accident. I don’t see any reason why Sega would keep supporting the system, especially with the abysmal performance of each and every game they released for it. Maybe for the NX. Every game? I think you’re ignoring the existence of Splatoon, Hyrule Warriors, Super Smash Bros. for WiiU, Sonic Lost World, Sonic and All Stars Racing Transformed, Tekken Tag Tournament 2 WiiU Edition, The Legend of Zelda Windwaker HD, The Legend of Zelda Twilight Princess 3D, Mario Kart 8 and literally every eShop title, from NES and GBA right up to Wii. well i dont mind this title being on PS4 and Xbox ONE but what about the Wii U don’t SEGA care about the Wii U? that would be a prefect anniversary title if this game gets on next generation consoles with just 3 consoles. I’d love to see a remake of Sonic 1, 2 and 3, But have it as a retelling of the story adding additional content, Like cutscenes between games to link them together (Maybe the odd new level to link them together?). Some dialouge and voice acting would be cool too. I presume there’s going to be a new 3D main title with modern Sonic but with some adventure style vibes and referances. Also a Remake of the classic trilogy. That way they will please both sides of the fan base, I guess the remake will be a Digital Release only though. Fine, how about a Sonic game where you can play as six characters, each with their own story campaign, in linear 3D stages, along with Chao Garden, melodic rock music, Jun Senoue as the lead composer, plus involvement with Ryan Drummond, Scott Drier, Hunnid-P, and Marlon Saunders. Yes please. Oh, wait, that was sarcasm. My bad. Just a thought, wouldn’t the best way to show the new return to form policy that Sonic Team and SEGA keep boasting be to make a complete, from the ground up, 3D remake of Sonic 1?